During past 7 years, we launched suitable services to help Investors to create wealth by investing in Indian stock market. Its appreciation and support of our readers that one of our most admired service - Hidden Gems ranks on top not only in performance but also on Google search engine. Try it out yourself by searching "Hidden Gem Stocks" or "Best Multibagger Small Caps" on Google, you will find our website www.saralgyan.in featuring on top in search results. Its your appreciation and word of mouth publicity which make our website featuring on 1st position in Google. That's not all, our other services i.e. Wealth-Builder, Value Picks and 15% @ 90 Days have also given much better returns compared to major indices year on year. 2. Value Picks (Mid Caps with Plenty of Upside Potential): Our equity analysts team consider Warren Buffet approach to short list stocks from mid cap segment as Value Picks. Market cap of Value Pick will range from 1000 crores to 10,000 crores. Holding period of Value Picks is 12 - 24 months and one can expect returns of 45-60%. Annual subscription charge of Value Picks is INR 6,000 under which you will receive total 12 Value Picks research reports (one on monthly basis). Click here to read more about Value Picks. Time has shown that smart investors have made their fortune by investing in equities in long term. None other asset class can match giving you such extra ordinary returns. Yes, its important for you to invest in right set of companies at right price for medium to long term. If you think to invest in stocks for period of 3 months or 6 months, we suggest you to stay out of stock market because you are not investing, you are betting on volatility of stock market which could be risky. Its our mission to ensure that you reap the best returns on your investment, our objective is not only to grow your investments at a healthy rate but also to protect your capital during market downturns. It gives us immense pleasure to inform you that 46 Hidden Gems out of 64 (released till Dec'16) have given more than 100% returns to our members during last 7 years. 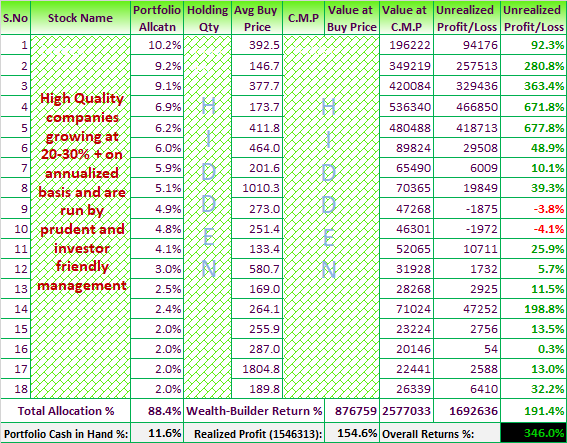 Moreover, 33 stocks out of these 46 have given returns in the range of 200% to 1950% during the same period. Through Hidden Gems and Value Picks, we're providing you opportunities to invest in such small / mid caps stocks today. Infosys, Aurobindo Pharma, Yes Bank, Bajaj Finance were the small cap stocks in past and today are the well known companies falling under mid and large cap space. Moreover, under our Wealth-Builder service, we encourage our members to replicate our Wealth-Builder portfolio by investing in selective high quality small and mid cap companies. These companies are reporting 20-30% + annualized growth and got their due share of re-rating and delivered exceptional returns to our members so far. 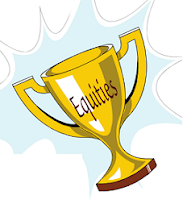 Since 1st Jan 2013, Nifty has given returns of 70.9%, Sensex returns is 65.6% where as Wealth-Builder portfolio has given returns of 346% returns to our members. Now you can add power to your equity portfolio by investing in best of small & mid cap stocks - Hidden Gems & Value Picks. Enjoy great savings and receive valuable freebies under Saral Gyan Dussehra Diwali Offer by availing subscription of our Hidden Gems, Value Picks & Wealth-Builder services.